Have you ever wanted to travel back in time to see the events of history unfold before your very eyes? For Christians, the greatest events were Jesus' death and resurrection-when our Saviour conquered death so that we could be made right with God and live for eternity. 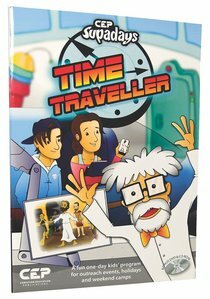 In Time Traveller Supaday, we can glimpse the wonder of this life-changing event through the zany characters of Professor von Razza and his young friend, Andy as they explore history in their Time Machine. This innovative one-day program gives children aged 5-12 an overview of Jesus' life and encourages them to trust the historical evidence that Jesus died and rose to life again. Combining indoor and outdoor games, multimedia and craft activities, Time Traveller Supaday is perfect for outreach events, pupil-free days and church camps with a separate children's program. About "Time Traveller (Ages 5-12) (Supadays Series)"
Customer Reviews For "Time Traveller (Ages 5-12) (Supadays Series)"